NOTE: This article applies only to Player for Windows and assumes you have an Enterprise-level account. 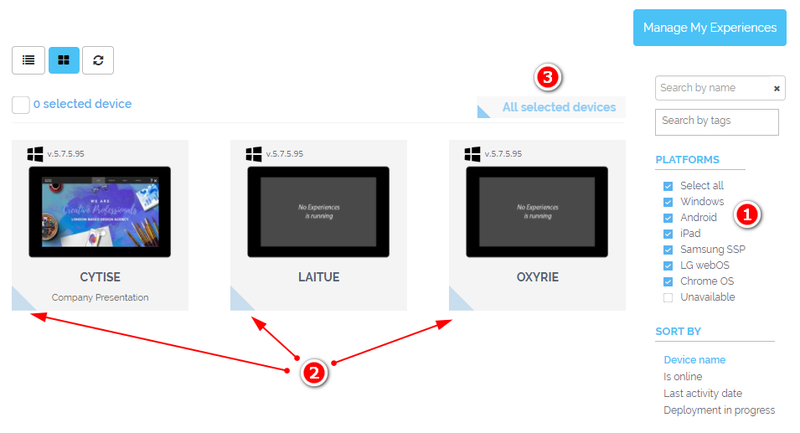 This capability can be remotely toggled on and off through the use of the Share and Deploy console. In the "Manage My Players" view, select the one or more Players you wish to configure. To select more than one Player, filter by name/tab/platform, select the triangle in the lower-left corner of each Player you'll be targeting then click the "All selected devices" button. 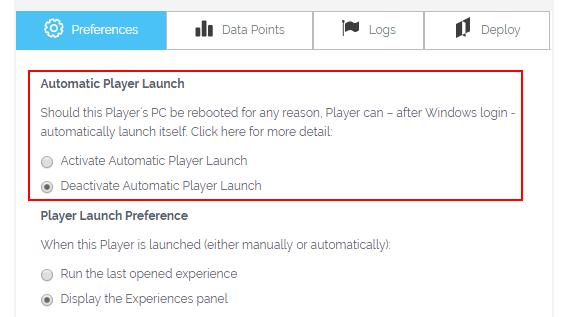 In the information panel that appears, on the "Preferences" tab, choose your preference in the Automatic Player Launch section. For the automatic restart to work, you must turn on Windows Automatic logon for the Windows account used to install Intuiface. Automatic restart is unnecessary when using Windows kiosk mode as in this mode, by definition, Player will be automatically launched after a reboot.